Cream Of Wheat Instant HOT CEREAL Contains 12 packs Large Box Total 12oz 340g Box Kosher Ingredients: Wheat Farina, Salt, Partially Defatted Wheat Germ, Guar Gum, Natural Flavor, BHT (to Preserve Freshness). Vitamins and Minerals: Calcium Carbonate, Ferric Phosphate (Source of Iron), Niacin, Vitamin A Palmitate, Pyridoxine Hydrochloride (Vitamin B6), Thiamin Mononitrate (Vitamin B1), Riboflavin (Vitamin B2), Folic Acid. Microwave directions: 1. Mix cereal and 2/3 cup water in microwavable bowl. For Creamier cereal, use fat free milk. 2. Cook on high 1 to 1-1/2 minutes (Microwave ovens vary. Cooking time is approximate). Stir 1 minute and serve. Conventional directions: 1. Empty packet into bowl. 2. Add 2/3 cup boiling water all at once. For creamier cereal, use hot fat free milk. 3. Stir 1 minute or until well blended. For thinner cereal, use a little more liquid. For thicker cereal, use a little less liquid. 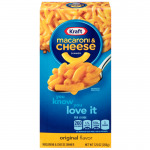 Manufacturer: Kraft Foods North America Inc. American Food Store London.